Born in London to an Austrian mother and Sri Lankan father, Peter Kuruvita spent much of his childhood in the Sri Lankan capital of Colombo, where he was introduced to the wonders of cooking by observing his grandmother prepare age-old Sri Lankan dishes in her simple kitchen. These early memories of the joy of cooking and the kitchen as the hub of the household formed the path of Peter’s future. The family moved to Sydney, Australia and Peter applied for a chef apprenticeship once he left school and started his long career working in restaurants as a chef. After three decades as an award-winning chef and restaurateur, Peter has now diversified his career to encompass the roles of TV presenter, author, industry speaker and restaurant consultant. After establishing himself as a well-known chef in Australia and cooking around the globe, Peter opened Sydney’s award-winning Flying Fish Restaurant & Bar in 2004, and successfully led the kitchen team as Executive Chef for eight years. Today his legacy still lives on through its’ creative modern dishes with a strong seafood focus and great reputation. With his career as a chef, restaurateur and consultant well established and well known, Peter decided to venture into putting his experiences and recipes onto paper and film. 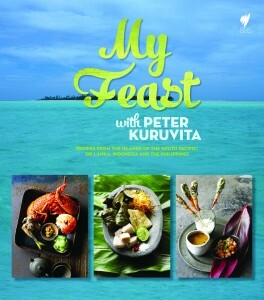 Memories of his idyllic childhood spent in Sri Lanka, inspired his first cook book “Serendip – My Sri Lankan Kitchen”. The book takes food lovers on a journey through the kitchen experiences of his childhood with traditional recipes and stunning photography. Peter then began to present Television series produced by The Precinct Studios for SBS Television, which air on many networks worldwide. 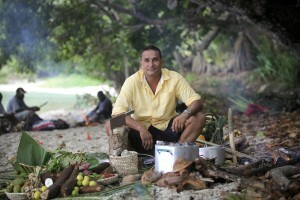 His shows combine beautiful scenery with sensational local cuisine as he immerses himself in the cultures of the unique lands he travels through. The first of these was “My Sri Lanka with Peter Kuruvita” which combines breath-taking scenery with spectacular spicy fare as Peter travels across the country, experiencing the wealth of Sri Lanka’s beauty, culture and culinary diversity. “My Sri Lanka” was nominated for the ‘The Rockies’ Banff World Media Awards 2012’ and Peter nominated for an Australian ‘Logies 2012 Award’ in the “Best New Male Talent” category. His third10-part series, “Mexican Fiesta” is currently premiering on SBS television in Australia and sees Peter travelling the length and breadth of Mexico, looking deeply into the ingredients, dishes and culture of that exciting and sometimes misunderstood country. 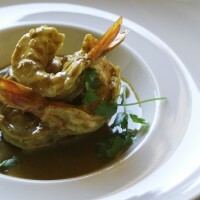 One of Peter’s signature dishes which is well-known and loved by many in Fiji and Australia is his Sri Lankan King Prawn Curry. The layers of aromatic spices and coconut compliment the fresh sweetness of the prawns perfectly. Enjoy! Peel the prawns leaving the tail on, reserve the heads and de vein them by cutting the digestive tract out of the center of their back. Clean the reserved prawn heads by removing the shell and washing out the guts, you should be left with just the legs and eyes. Add 200ml water in a food processor and blend until a smooth paste forms, then strain through a fine sieve, extracting as much liquid as possible. Discard the solids then combine the paste with the coconut cream. Heat the ghee in a heavy-based saucepan over medium heat, add the onion, garlic, ginger, curry leaves and pandanus leaf and cook over low heat for 6-8 minutes or until the onions are translucent. Add the prawns and all the remaining ingredients except for the prawn paste and stir continuously for 5 minutes. Add 300ml water to the pan, combine well and cook for another 7 minutes, then reduce to a low heat, stir in the prawn paste and cook for another 8 minutes or until the flavours are well combined, the sauce has thickened and the ‘raw curry’ flavour has gone. Do not let the curry boil or it will split. Remove from the heat and stand the curry for 1 hour to allow flavours to combine.